Devil's Gun sounds like AC/DC. Okay. I've just reduced this review to five words, and we could probably stop there. Or not. To be fair, some further exploration is required. One, formed in 2012 by drummer Fredde Johansson and guitarist Emil Holmstrom, Dirty N Damned is their first full-length album. Two, they like to compare themselves, with more than a little equivalency to Airbourne, Accept, and Motorhead. Maybe the first, not the last two. They sound like AC/DC. They sound like that iconic band for two reasons. First, at the heart of their sound is that boogie groove hard rock that put the Aussie band on the world stage. 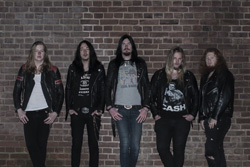 Second, vocalist Joakim 'Jocke' Hermansson sounds similar to original AC/DC vocalist Bon Scott, yet with some differences. He's more a screamer. So much a screamer, where upon, when listening to the album, and my wife stopped in the office, she says, "I don't get how you can listen to that?" "Yeah," I say. "Somebody screaming at you the whole time," she adds. Wherein, I say, "Yeah. I get that. And they sound like AC/DC. That's how I'm going to start me review." Also, He's barely understandable. Actually, he reminds me of a guy who used to be death metal vocalist until somebody asked him if he could sing like AC/DC. To which he said, yes. Otherwise, suffice to say Devil's Gun plays some hard rocking heavy metal tunes. Lots of strong guitar works in both riffs and leads. And the rhythm section is up to the task of laying down that proverbial groove. I would even suggest, contra the Aussie band, that Devil's Gun puts a little more speed metal into their songs. Yet, the bottom line is this: if you can take another AC/DC knock off and a singer screaming at you for 33 minutes, then Devil's Gun is your band and their album, Dirty N Damned a priority for your next music purchase. Me? I'll pass. At least until the next album. 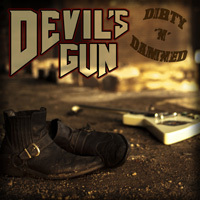 The bottom line is this: if you can take another AC/DC knock off and a singer screaming at you for 33 minutes non-stop, then Devil's Gun is your band and their album, Dirty N Damned a priority for your next music purchase. Me? I'll pass.